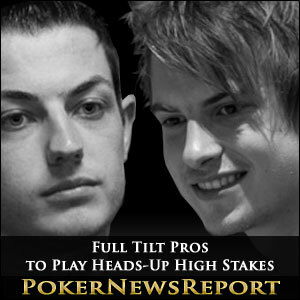 Viktor “Isildur1” Blom and Tom “durrrr” Dwan have agreed to play heads-up at Full Tilt, renewing a rivalry that had the poker community in awe three years ago. 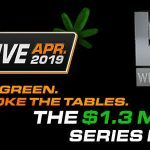 “The Professionals” (minus Gus Hansen), as Full Tilt’s pro stable is known, will each risk $100,000 spread out among four No-Limit Hold’em heads-up tables with $50/$100 blinds and a format of winner-take-all. The match is scheduled for Sunday, Dec. 9 at 15:00 ET and can be viewed by logging on to Full Tilt, selecting the “Find a Player” option found beneath the “Requests” menu, and typing in either player’s screen name, “Isildur1” or “durrrr,” in the search field. From there, click on all four tables to view all the action. Blom and Dwan were involved in some of online poker’s biggest pots back in 2009 when the duo competed at No-Limit Hold’em and Pot-Limit Omaha heads-up tables at Full Tilt. 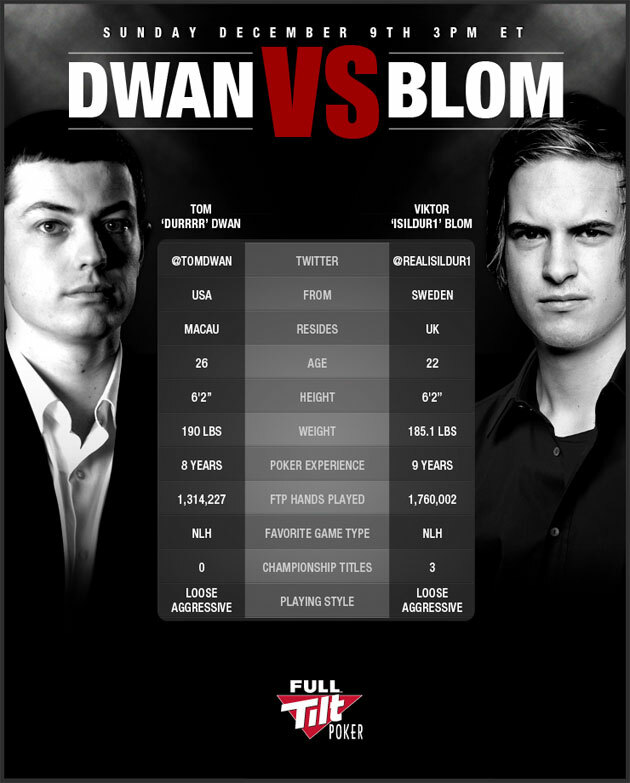 Dwan was an established pro at the time, but Blom’s identity was a mystery to poker fans. He burst onto the online poker scene a few months earlier, taking on the game’s best players for hours at a time in high stakes heads-up action. He and Dwan competed often, much to the delight of railbirds, who were clamoring for “Isildur1” to reveal his identity. It was not until the PokerStars Caribbean Adventure in 2011 that Blom let the world know that he was the loose-aggressive player known as “Isildur1.” By that time, the young Swede had won over $5 million at Full Tilt, much of that amount obtained from Dwan. So players could now put a face to the screen name of what many consider to be one of the finest heads-up high stakes players the world over. Blom recently announced the upcoming heads-up match by tweeting, the poker gods and @FullTiltPoker have answered my tweets. 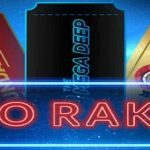 @TomDwan has accepted my challenge and wants to play this Sunday. He further stated his excitement toward the event on Twitter by saying, this is yrs in the making and will be so fun! The amount of money at stake is much less than was tossed around three years ago, but the intensity of the action promises to rival that between the two superstars during their 2009 confrontations on the virtual felt. While exciting FTOPS XXI action will be underway at Full Tilt on the tournament tables this Sunday, Blom and Dwan will be matching that excitement on the cash game tables.